Native of Africa and the Seychelles and now grown as a popular culinary herb in Europe. Basil is used in baths and body massage by ancient Greek nobles for its fragrant perfume. The Egyptians used the Aromatic fragrance in their offerings to the gods and also mixed it with essences of myrrh and incense to embalm bodies. In India it is believed to offer protection to the soul and is sacred to the Hindu gods, Krishna and Vishnu. It can grow up to 3 feet in height and has small white flowers. The essence is distilled from the leaves and is light greenish yellow with sweet green overtones. The crisp smelling of this essential oil is often used in aromatherapy as it awakens the mind to clarity of thought, steadies the nerves. The basil oil has sweet, herbaceous, licorice-like and slightly campherous. Aroma: Specific spicy, strong, pleasant and fresh, slightly balsamic with a tarragon note. Basil oil has various chemical compounds that include a-pinene, camphene, b-pinene, myrcene, limonene, cis-ocimene, camphor, linalool, methyl chavicol, y-terpineol, citronellol, bornylacetate , geraniol, methyl cinnamate and eugenol. Extraction: It is extracted by steam distillation of leaves. Ideal as a nerve tonic, helpful to lift fatigue, anxiety and depression. It is also good for bronchitis, colds, fever, gout and indigestion and reputed to soothe snake bites. The therapeutic properties of basil oil are analgesic, antidepressant, antispasmodic, anti-venomous, carminative, cephalic, diaphoretic, digestive, emmenagogue, expectorant, febrifuge, insecticide, nervine, stomachic, sudorific, tonic and stimulant. It also acts as a powerful antiseptic and mostly used for inhalation, baths, massages. Basil essential oil is used typically to massage the skin. It enhances the luster of dull looking skin as well as hair. As a result it is extensively used in many skin care supplements that claim to improve the tone of skin. It is also used for acne and skin infections. It is both soothing and uplifting when diluted in a base oil and used for massage. It has the effect of relieving gloom and fatigue. Aromatic Description: Fresh, sweet, floral, herbaceous, slightly fruity. Lavender essential oil is used as an antiseptic and can be used for many skin conditions and infections of the lungs, digestions and urinary tract. It works brilliantly for migraine. It is also considered to be helpful for nervous system disorders such as depression, headache, hypertension, insomnia, migraine, nervous tension, stress related conditions. Basil is most commonly recommended to be used fresh, and in cooked recipes, is generally added at the last moment, as cooking destroys the flavor quickly. The fresh herb can be kept for a short time in plastic bags in the refrigerator, or for a longer period in the freezer, after being blanched quickly in boiling water. Basil is sometimes used with fresh fruit and in fruit jams and sauces - in particular with strawberries, but also raspberries or dark-colored plums. Arguably the flat-leaf basil used in Vietnamese cooking, which has a slightly different flavor, is more suitable for use with fruit. There are two types of basil, sweet and bush. 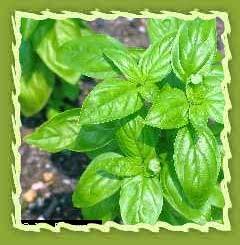 Sweet basil has large, shiny, dark green leaves and grows 30-60 cm/1-2 ft high, with white flowers. Bush basil is very bushy and grows to be only 15 cm/6 in high, with lots of green leaves and tiny white flowers. Basil is an aromatic plant, originating in India, whose name is derived from Greek basilisks, meaning royal: only the sovereign (Basilius) was allowed to cut it. Sweet basil is now widely grown as a pot herb. The leaves, which have a strong flavor of lemon and jasmine, are much used for flavoring in the cuisines of southern France and Italy. Some of the aroma is lost in drying, but the leaves can be successfully preserved in olive oil. Basil is particularly favored with tomatoes, but can also be used to flavor salads, stuffings, sauces and omelette's as well as soups (pistou) and pasta dishes.